Get away from it all and enjoy the luscious scenery of a secluded countryside setting. This really is a superb location in which to spend a holiday. For those seeking a relaxing holiday amid wonderfully tranquil scenery this villa offers the perfect setting. The house is set in a finca of 8,000 square metres, in the foothills of the Sierra Tejeda-Almijara. 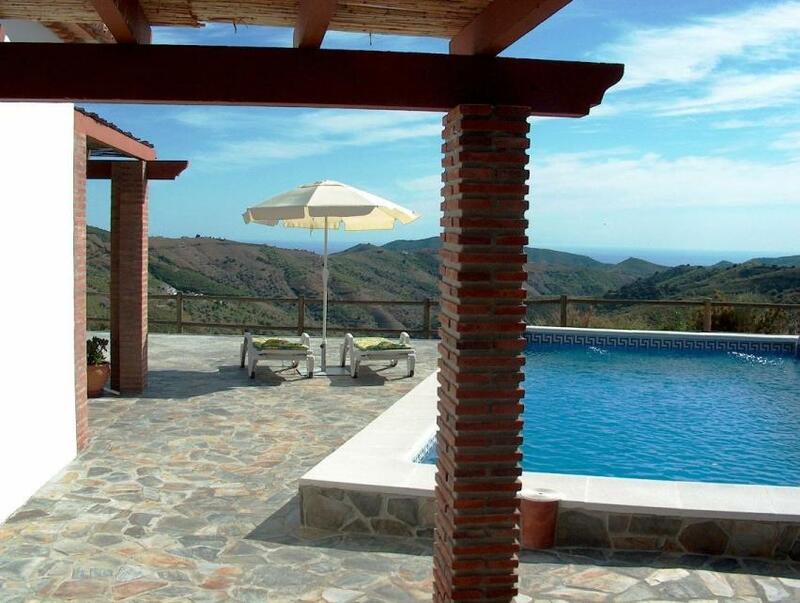 Casa Las Jaras is a newly constructed villa with private pool (8 m x 4 m, 1.30 - 1.90 depth). It has a delightful feeling of comfortable seclusion about it -yet it is perfectly situated for visits to the Málaga coast, while the historic city of Granada would make an excellent day trip. It stands near the old Moorish villages of Archez and Salares, approximately 30 minutes from the coast, and is set in the magnificent landscape of the Natural Park 'Sierra Tejeda-Almijara' mountains, surrounded by vine-covered hills and a valley sweeping down to the sparkling blue sea in the distance. The surrounding area offers excellent opportunities for walking, particularly in the cooler months and Spring. Casa Las Jaras and the swimming pool area in particular, is in an enviable location, taking full advantage of the sweeping scenery and the hot Andalucian sun, tempered throughout this area by the altitude and the fresh mountain breezes. Its geographical location and the beauty of its scenery, makes this area a wonderful place for a holiday at any time of year. All on one level, this house is ideal for anyone looking for a lazy, relaxing holiday well away from the madding crowd but near enough to the villages of Salares, Archez, Canillas de Albaida and Competa for enjoying a night out in one of the many bars and restaurants. The Natural Park 'Sierra Tejeda-Almijara' is a carefully preserved area of spectacularly natural beauty teeming with wildlife including deer, mountain goats, hawks and eagles. As well as heaven for nature-lovers, the park is also a walker's paradise. Alternatively, a choice of sandy beaches can be found just 30 minutes by car, while the delightful resort of Nerja is not far away - a visit to its famous caves is well worthwhile. For those who like to combine the usual holiday pursuits of swimming and sunbathing with some history and culture, there is plenty to see in this area. 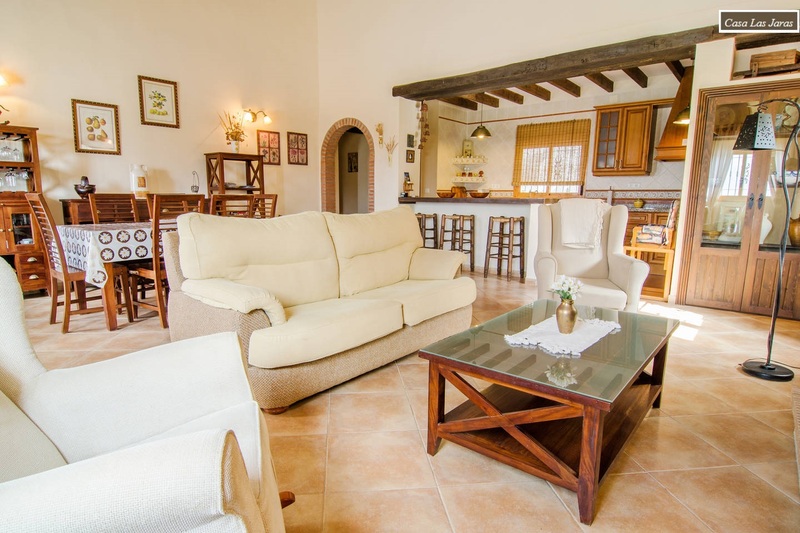 Casa Las Jaras also provides a great base for a walking holiday. Discover the real Spain!. Unspoilt countryside, magnificent mountain views and glorious weather!. 'We had a very nice holiday in this villa. It's a beautiful and peaceful place. We hope we'll come back some day'. 'A very pleasant & relaxing week in a beautiful villa, in superb surroundings'. 'The villa was as described; clean, very comfortable, well equipped and in a lovely position. The pool and terraces were perfect for private sunbathing, swimming, playing and outdoor dining. The coastline is about 25 kms away but the inland regions are much more interesting with some stunning scenery and pretty white villages. We enjoyed evening walks around the villa spotting eagles, buzzards and hawks overhead. I would recommend this villa for those who want to be in comfortable pleasant surroundings away from the crowds'. 'We love the villa and spent our time relaxing. All in all, such a wonderful holiday'. 'The most relaxing holiday we have had. It was our first time in a villa and we would definitely do it again'. 'A small bit of Heaven!'. 'Andalucian spring was wonderful and we enjoyed to spend this time in this beautiful villa! We have never seen so many flowers in blossom at the same time! Thank you for our time spent at Casa Las Jaras'. 'My sketches of the wild flowers will be a permanent reminder of a peaceful break'.